Vitor Belfort’s Cornermen T shirt will be worn by Vitor’s team in UFC 103, when Vitor makes his second return to the UFC and fight Rich Franklin at a catch weight of 195lbs. MMA fans around the world are very familiar with Vitor Belfort, a legend of this sport. He has knocked out some of the best in the world: he KO’d Wanderlei Silva in 44 secs, and Tank Abott in 54secs. While also securing victories over top fighters including Randy Couture, Heath Herring, Marvin Eastman, Terry martin, and Matt Linland. 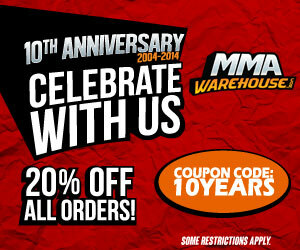 Belfort has a Brazillian black belt under Carlson Gracie and he currently trains at Xtreme Couture. The Vitor Belfort Cornerman T-shirt is made by RVCA, an athletic clothing company that is known for its streamlined designs. 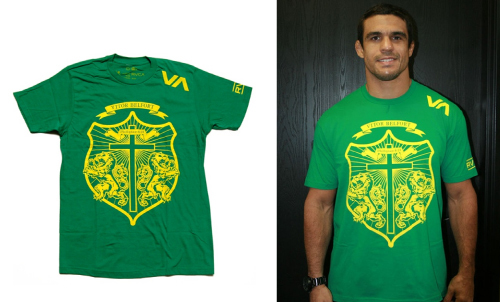 As you can see, Belfort’s team shirt has no embellished graphics, they just are cool and simple featuring a cross, shield and griffins on the front center and the RVCA logo on the sleeve. This RVCA shirt is perfect for those of you who want a fresh and clean style, unlike the the typical “Affliction style” MMA T-shirts.